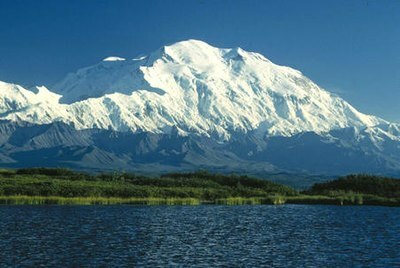 Denali in Alaska is the highest mountain peak of North America. Denali is the third most topographically prominent and third most topographically isolated summit on Earth after Mount Everest and Aconcagua. The following sortable tables comprise the most topographically prominent mountain peaks of greater North America. Each of these 353 summits has at least 1500 meters (4921 feet) of topographic prominence. This article defines greater North America as the portion of the continental landmass of the Americas extending westward and northward from the Isthmus of Panama plus the islands surrounding that landmass. This article defines the islands of North America to include the coastal islands of North America, the islands of the Caribbean Sea, the Lucayan Archipelago, the Bermuda Islands, the Islands of Greenland (Kalaallit Nunaat), the islands of Northern Canada, the islands of Alaska, and the islands of the northeastern Pacific Ocean. The Hawaiian Islands are not included because they are considered part of Oceania. Topographic elevation is the vertical distance above the reference geoid, a mathematical model of the Earth's sea level as an equipotential gravitational surface. The topographic prominence of a summit is the elevation difference between that summit and the highest or key col to a higher summit. The topographic isolation of a summit is the minimum great-circle distance to a point of equal elevation. This article defines a significant summit as a summit with at least 100 meters (328.1 feet) of topographic prominence, and a major summit as a summit with at least 500 meters (1640 feet) of topographic prominence. An ultra-prominent summit is a summit with at least 1500 meters (4921 feet) of topographic prominence. All elevations in the 48 states of the contiguous United States include an elevation adjustment from the National Geodetic Vertical Datum of 1929 (NGVD 29) to the North American Vertical Datum of 1988 (NAVD 88). For further information, please see this United States National Geodetic Survey note. If a summit elevation or prominence has a range of values, the arithmetic mean is cited. Denali is one of only three summits on Earth (along with Mount Everest and Aconcagua) with more than 6000 meters (19,685 feet) of topographic prominence. Mount Logan exceeds 5000 meters (16,404 feet) of prominence. Four peaks of greater North America exceed 4000 meters (13,123 feet), ten exceed 3500 meters (11,483 feet), 17 exceed 3000 meters (9843 feet), 34 exceed 2500 meters (8202 feet) and 100 exceed 2000 meters (6562 feet) of topographic prominence. Of these 353 ultra-prominent summits of North America, 143 are located in Canada, 122 in the United States, 38 in Greenland, 26 in México, eight in Honduras, six in Guatemala, four in El Salvador, three in Costa Rica, three in the Dominican Republic, two in Haiti, two in Nicaragua, and one each in Jamaica, Cuba, and Panamá. Six of these peaks lie on the Canada-United States border and one lies on the El Salvador-Honduras border. The following sortable table comprises the 353 ultra-prominent summits of greater North America. Each of these peaks has at least 1500 meters (4921 feet) of topographic prominence. The topographic elevation of a summit measures the height of the summit above a geodetic sea level. The topographic prominence of a summit is a measure of how high the summit rises above its surroundings. The topographic isolation (or radius of dominance) of a summit measures how far the summit lies from its nearest point of equal elevation. Denali is one of only three summits on Earth with more than 6000 meters (19,685 feet) of topographic prominence. Mount Logan exceeds 5000 meters (16,404 feet) of prominence. Four peaks of greater North America exceed 4000 meters (13,123 feet), ten exceed 3500 meters (11,483 feet), 17 exceed 3000 meters (9843 feet), 34 exceed 2500 meters (8202 feet), 100 exceed 2000 meters (6562 feet), and the following 353 ultra-prominent summits exceed 1500 meters (4921 feet) of topographic prominence. Of the 353 ultra-prominent summits of North America, 143 are located in Canada, 122 in the United States (excluding six in Hawaiʻi), 38 in Greenland, 26 in México, eight in Honduras, six in Guatemala, four in El Salvador, three in Costa Rica, three in the Dominican Republic, two in Haiti, two in Nicaragua, and one each in Jamaica, Cuba, and Panamá. Six of these peaks lie on the Canada-United States border and one lies on the El Salvador-Honduras border. Additional references for the 200 most prominent of these summits can be found on the List of the most prominent summits of North America.